That’s where Better Cigar comes in. Whether you are looking for a Father’s Day cigar gift or a birthday present, let us help you find the best gifts for cigar lovers in your life. We have carefully selected the top 5 best gifts for cigar lovers along with in-depth reviews of each product to help make your purchasing decision easier. Cigars themselves are tough gifts to give someone because there are literally thousands of options. Furthermore, it’s hard to figure out what someone prefers when it comes to taste. Chances are that most people who are passionate about cigars have more than enough cigars to begin with, therefore cigar accessories can be the perfect gift for cigar lovers. This Cohiba travel case boasts one of the most familiar and popular Cuban cigar brands. With cedar interior and brown leather on the exterior, this travel cigar case is sharp and will keep your cigars protected. It comes with a lot of extras as well: black gift box, velvet gift bag, cigar cutter, and a humidification device. The humidification device isn’t great, as expected. 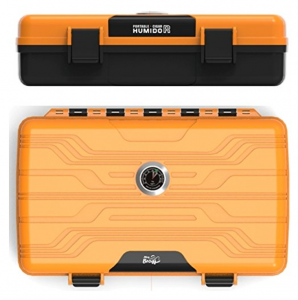 However, if you are purchasing this travel case then you are likely not going to have your cigars in there long so humidification may not be necessary. If you do need humidification, we would strongly recommend grabbing the small Drymistat humidifer tubes. Lastly, this case only holds four cigars, which usually is enough, but if you are bringing cigars to share amongst a group, you may want to upgrade. This travel cigar case is strictly business – perfect for a business trip or a destination where you would like to show off a cigar collection in style. 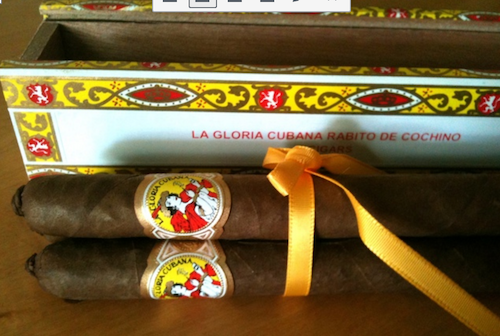 The bonus extras make this travel cigar case a great value. However, the limited cigar capacity could be a negative for those out there who like to share cigars. If you are looking for something that can withstand the elements a little more than the Cohiba cigar travel case, then look no further. This case is airtight and weatherproof – perfect for taking your cigars on your next fishing or hunting trip. This may not be leather but it still looks very sleek and has very reliable latches. Like many cigar storage devices, this humidification device and hygrometer can be wildly inaccurate. We suggest purchasing a digital hygrometer and your own humidification device. The good news? This unit is big enough to carry all of this and still handle a bundle of cigars. With more protection and space for your cigars, Mrs Brogs travel humidor is one of the best gifts for cigar lovers in need of a rugged cigar storage solution. 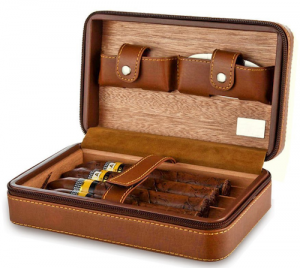 This traveling humidor case is great for taking cigars on a long weekend. I would think a bachelor party or perhaps a guy’s trip to the mountains could really use a case like this. However, this type of case is not for long-term cigar storage, I would go with a desktop humidor for that. 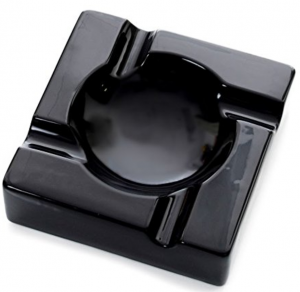 A cigar ash tray with a little attitude – this ashtray says a lot without too much razzle dazzle. Sleek black ceramic makes it heavy but not so heavy that you could break your toe with it. Keep your cigars save from the wind or from burning a hole on your table with the deep ridges. Nice capacity with the ability to hold 4 cigars simultaneously. An ashtray isn’t the most exciting, it’s more one of those function over form type cigar gifts but nevertheless very important. Having nice cigar accessories like an ashtray can go along way, especially if the cigar lover in your life loves to smoke with buddies. With room for 4 cigars, heavy enough to withstand a windy day, and a professional style, the Mantello cigar ashtray checks all the boxes. If that cigar lover in your life has a lot of cigar accessories, this is certainly a great option, even if they already have one cigar ashtray! A cigar table lighter might not be something that you are familiar with but man, these things are cool… and efficient! 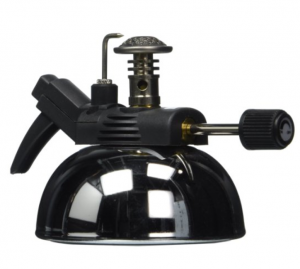 This tabletop cigar lighter in particular is super reliable and better yet, windproof. Cigar lighters can be a real challenge to light, especially if you have a smaller one. This table cigar light from Alec Bradley has a nice big flame and with a 1.4 oz butane canister. With those kind of specs, you are going to be lighting more cigars than you can smoke. One of the best things about this specific lighter is the lighting mechanism. You don’t have to hold a button down to keep the flame on while lighting the cigar. This is huge because having to hold a button as you light the cigar can be a hassle. This item does not come with butane due to shipping restrictions but the good news is that you can purchase it from Amazon as well. The Vector Quintuple Refined Butane Gas Refill Cans are our favorite pick to accompany this tabletop cigar lighter. This should be enough butane to last for a good 2-3 months at the very least. This gift is perfect for someone who seems to have it all and has a nice smoke setup to place a tabletop lighter. However, if they are smoking cigars mostly on-the-go, you might want to look elsewhere. You may be familiar with redwood – it’s a beautiful reddish brown wood and chances are it can be a great compliment to a humidor. Xikar is the top cigar cutter company out there and this product will surely last through many cigars with high-quality stainless steeler blades. The best part? It comes with a lifetime warranty. As with any cigar cutter, the risk is losing it. Although this is a great investment, a cigar cutter like this can cause some heartache if you lose it. With a lifetime warranty, you can always get it replaced but keeping tabs on this is a must! Xikar also makes a sharkskin sheath, or pouch, that is a great way to ensure you keep track of and protect your cutter. Cigar cutters is our #1 best gift for cigar lovers for a reason. Having a good cigar can totally change your experience with cigars and it’s typically something that people skimp on. A nice, clean and consistent cut on a cigar can make a good cigar, great. 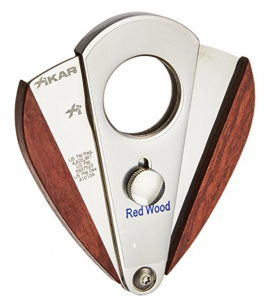 This cigar cutter from Xikar is great regardless of how you cut it! This wraps our gift guide to help you choose a great gift for a cigar lover in your life. We wanted to provide a wide variety of gifts to choose from, because every cigar smoker is different. One last thing… who says you can’t be buying a gift for yourself? !